Way past it's prime, even refrigerated for past many years. Bottled in 2009. This is probably 3 years past it's prime. It kind of tastes like apple juice. Low carb, not bad by any means, but tasting kind of old. Gotta put out there initially that I'm drinking this with a couple years on it, mostly to see how it's holding up. It pours a slightly hazy golden-straw topped by a finger of lightly off-white foam. The nose comprises grass, musty hay, light clove, light musty orange peel, and a twist of lemon. The taste brings in more of the same, along with some flowers and a pinch of what seems to be black pepper. All of the flavors kinda collide a bit near the finish, making for a muddled sort of experience. The body is a light medium, with a light moderate carbonation, a slightly watery feel, and a drying finish. Overall, still a pretty decent saison, but it's definitely showing its age now. 22oz. bomber: Hiding in the back of the fridge. This one pours a clear golden color. There was a small white head that lingered a short while. The nose is good. Earthy and grassy notes are the main items. Some spices with a hint of peaches. The taste is good. Very clean and crisp. Hints of citrus and peaches to the taste. Somewhat lighter body. Slightly spicy and just a bit dry. A very nice beer! 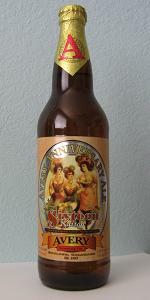 Two finger frothy head with good retention and lacing on a clear golden body. Aroma is mostly tropical fruit with mostly pineapple, some lemon custard, a little grainy and little in the way of Belgian character. Flavor is a little understated, the Belgian yeast goes well with the creaminess, fruits are mild and mostly are of lemon. The herbal flavors are generic. Creamy body, pretty dry finish, moderate carbonation. I don't know how age may have affected this one. I had this one stored and forgot about it. It's easy to drink just bland.